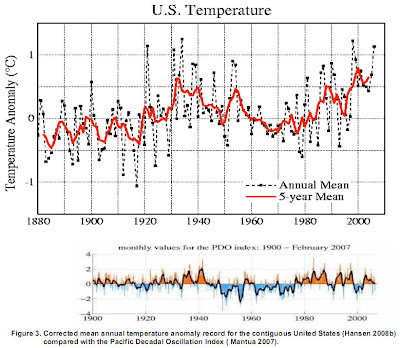 The corrected temperature record for the contiguous US is shown above (Hansen 2008). After correction, the highest temperature ever recorded in the US since 1880 was in 1934. There is no steady rise as predicted by greenhouse gas theory, but evidence of periodic oscillation of about 70 years, with a previous peak around 1933. Plotted below is the behavior of the Pacific Decadal Oscillation (Mantua 2007) over the same period, showing the same periodic behavior. For a current graph of the Pacific Decadal Oscillation (PDO), see the widget on the right side above.